Three computer whiz kids in Year 8 are acting as technology mentors for the entire Preparatory School student body, and even quite a few teachers. Caleb, Cameron and Mitchell run twice weekly Fountain of Knowledge technology training sessions, with students able to book appointments on a sophisticated website set up by Caleb. “I took over the project from its founder Ward (now Year 10) when I was in Year 6. We have seven mentors including the three of us, and are training up some Year 6 students so they can run the sessions next year,” says Caleb. The students help with everything from setting up the internet on laptops, phones and tablets, to installing anti-virus software, and helping students to get the most out of OneNote. They also teach students how to use the cameras and other equipment in the TV studio. Their teacher Ms Melissa Rennell says she sometimes has teachers knocking on her door seeking technical help from one of the boys, or asking for assistance with their Activboards. “They often go to these students first before the ICT Department.” Caleb has even rebuilt an old laptop from the Preparatory School and connected it up to an active board on which students can share their projects. As they get ready to hand over the Fountain of Knowledge at the end of the year, Caleb, Cameron and Mitchell are thinking about which equally enthusiastic young technology experts they will pick as its new leaders, and are already training Year 6 student Nicholas. 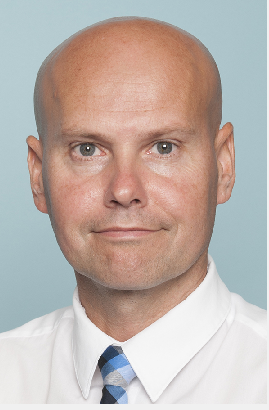 “We’re proud of the programme and have had a lot of support from Mr Dekkers, who will be the teacher in charge of it again next year,” says Caleb. Cameron says he enjoys technology but isn’t planning on a career in the field at this stage. However Caleb and Mitchell hope to one day own their own technology companies, “like Apple, or Google”. The Background Situation: existing Minecraft usage and identified problems. 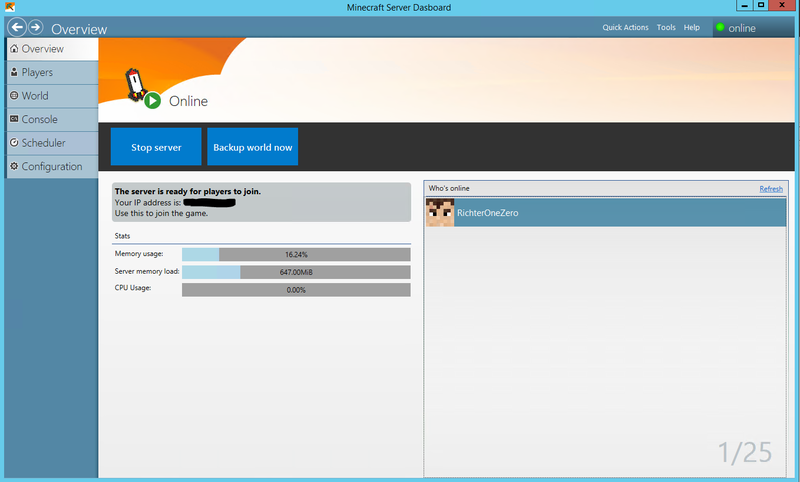 The Opportunity: what we felt we needed to deliver to run our own Minecraft server securely and easily. A game about placing blocks and going on adventures. Explore randomly generated worlds and build amazing things from the simplest of homes to the grandest of castles. A number of our teachers have already integrated Minecraft into teaching units in the past, most notably Mr Wilj Dekkers with his creative writing units and Kiwiana-themed parks and Ms Donna Jones exploring a Centenary related project. Despite this initial success there has always been some problems with administering Minecraft, particularly around easily and securely allowing student interaction and collaboration in these virtual worlds. 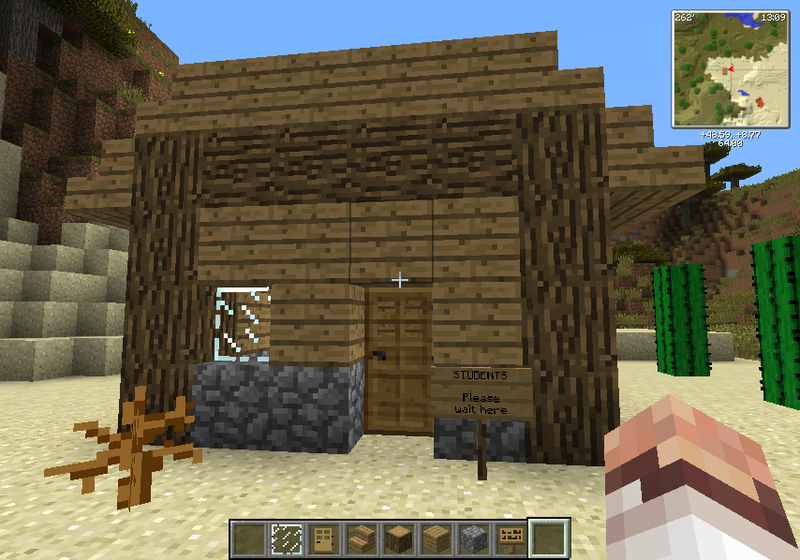 To date, teachers have had to rely on students using the Minecraft Personal Edition meaning it was essentially single player mode only, removing the ability to collectively work on a project together. To promote greater student engagement and allow the key competencies to be fully utilized in learning through Minecraft, alternatives needed to be identified. In late September 2014, Microsoft purchased Minecraft for $2.5billion which held out the possibility of a deeper integration into Office365 and Microsoft’s wider Education strategies. It took just under two years before Minecraft Education version was released, during which time an alternative Minecraft Edu was essentially shut down and absorbed into Microsoft’s new Education version. This was a shame as the Edu version was very good, allowing the use of numerous custom mods (modifications to improve/customise the game play) and it could be run on a hosted server, not just on the student’s personal device. There was no ability to host the game on a stand alone server – now it would be installed and hosted via the teacher’s laptop computer (this raised significant security concerns for us and ultimately was a show stopper). There was no custom mod support whatsoever. Over time, it was the ability to modify and customise the game play that had contributed to the enduring appeal of Minecraft and without this, the default game play was less appealing. The upside, however, was that licensing was incredibly easy to manage and, if you were prepared to overlook security concerns, deployment for a teacher in a basic network would also be simplified. Teacher Control: teachers would need the ability to easily manage students within the game. Without this, the chances of students running amok and getting into mischief was very real. This would require third party mods to achieve and a strategic plan around how Digital Citizenship teaching could be included into the Minecraft worlds. The Minecraft server needed to be hosted centrally so that it could be controlled by the ICT services team, whilst still allowing the delegation of in-game management to teachers and to those students identified as leaders who could be student administrators. Teacher/Student administrators needed the ability to maintain / deploy approved mods and perform low level administration work e.g. restarting worlds, creating/deploying new worlds. Finally, the issue of how to deploy a pre-configured client onto student BYOD devices in a quick and simple manner, without disrupting any existing installations of Minecraft they may have already installed. The above list of requirements needed addressing if we were going to be able to build a sustainable environment for integrating Minecraft into the eLearning strategies at the College. Joshua decided he would explore various options based on his prior knowledge administering various Minecraft servers in his own time and see if there could be some suitable solutions to use at St Andrew’s. For the proof of concept, we decided to use an existing HP Compaq 6000 that was spare. The specifications of this machine were pretty light weight, having only a Core2 Duo CPU and 4GB of RAM. It remains to be seen if this will be sufficient and we anticipate needing to increase the resources of this machine as more users and worlds join. Bukkit This has been replaced with Sponge due to a potential copyright issue; this has resulted in dropping KCauldron as well. These are essentially APIs that allow other mods to run on the Minecraft server and normally a Minecraft administrator would use only one or the other of Forge or Bukkit. However, as will be seen, it was necessary to use both and to achieve this an additional third party tool called KCauldron was necessary to enable the use of different mods on the same platform to work nicely together. With the use of Sponge, there is no need for third party tools like KCauldron, as Sponge integrates directly into Forge. 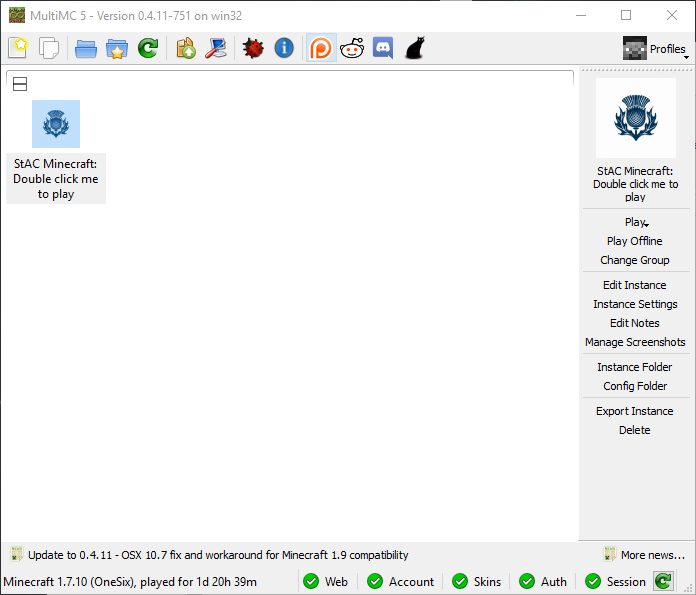 Another important tool was MC Dashboard which allowed Joshua to use a graphical user interface (GUI) rather than a traditional command line interface (CLI) to administer the Minecraft server. This tool provides easy oversight into server resource usage, connected users and other important information. Multiverse: Project Worlds: (Project Worlds replaces Multiverse due to the changes above relating to Bukkit – everything following remains the same) This is a key one as it allows us to run parallel worlds on the same server, whilst enabling teachers and/or students to jump between worlds at will. Put practically, a teacher could create a world for a collaborative social studies project where students need to work towards an assessment or project, whilst having a separate world for “free play” and experimentation. Without Multiverse, projects would need to be separated spatially within the same world which would inevitably lead to problems, such as having to walk a long way to go from one project to another – it all takes time! Student Administrator – have slightly elevated controls such as the ability to move other student users around, freeze them and do other temporary modifications. These permissions are designed to support a Digital Citizenship component where students can be educated and entrusted to self-manage as much as possible within the game. The assigned permissions here were carefully selected by Joshua to prevent a student who had prior knowledge of how Minecraft administration works from being able to execute any command. Teacher – has access to most of the Minecraft server administration, can create new worlds, can kill off users, teleport users between worlds and other main administration functions. Administrator – aimed at superusers and, at this stage, reserved for ICT staff to support the server installation as necessary. ICY Admin: The Minecraft Macro/Keybind Mod (This was used to replace ICY Admin due to the version change of Minecraft) This is the key mod to bring the above together into a user-friendly GUI allowing for in-game administration from a graphical menu for the above user groups. The available menu options in ICY Admin The Minecraft Macro/Keybind Mod have been built from scratch by Joshua and are controlled by a config file on the Minecraft server itself. Users access the menu system during game play by hitting the tilde key (~) and this replaces the need to execute console / CLI commands within the game. This makes it significantly easier for new users to engage with the game and reduces the barrier-to-entry for teachers who may wish to administrate but know none of the commands. Some of the controls available via ICY Admin The Minecraft Macro/Keybind Mod include things such as “freeze” a user/all users in place (useful if you effectively want to pause the game for a break), teleportation of a single user / all users to a shared starting point or, for example, if you wanted them all to be in the same place to work on the same project. Additionally, environmental settings can be controlled in this way e.g. make it rain or snow, or set it to always be night time. These three core mods are what allows the overall setup and administration and, through conversations with Mr Dekkers, are probably sufficient to enable most scenarios of how Minecraft might be used at this stage. Two in-game mods specifically requested by Mr Dekkers were IndustrialCraft and ComputerCraft both of which allow for significant learning opportunities. 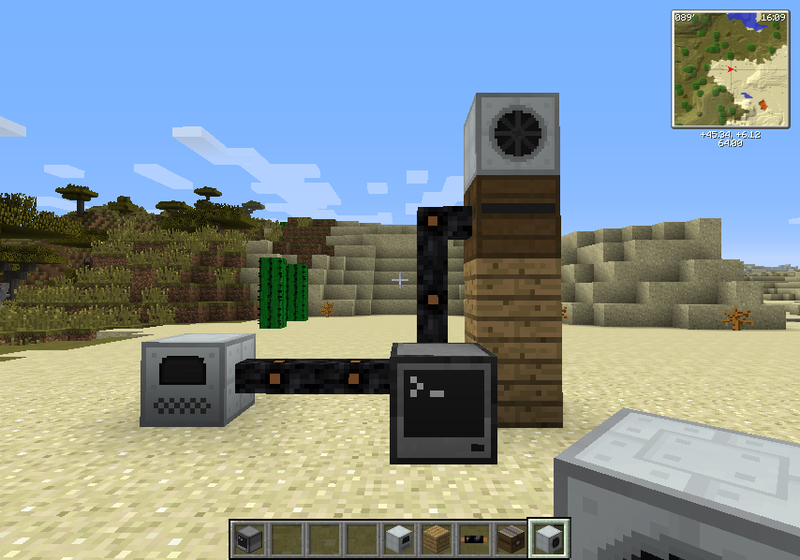 IndustrialCraft supports things like electricity generation and storage through batteries and transferring into different parts of the game, whilst ComputerCraft is essentially a full programming language accessible by computers in the game. With the setup of the Minecraft server achieved, the final part of the solution was how to easily deploy this to the individual student BYOD laptops. St Andrew’s College has a choice within parameters for BYOD, meaning students can bring either a Windows 10 laptop or an Apple MacBook running OS X. It was important that there was an easy, stress-free way for teachers and students to install this version of Minecraft onto laptops that did not necessarily need to involve the ICT Services helpdesk team at the College. 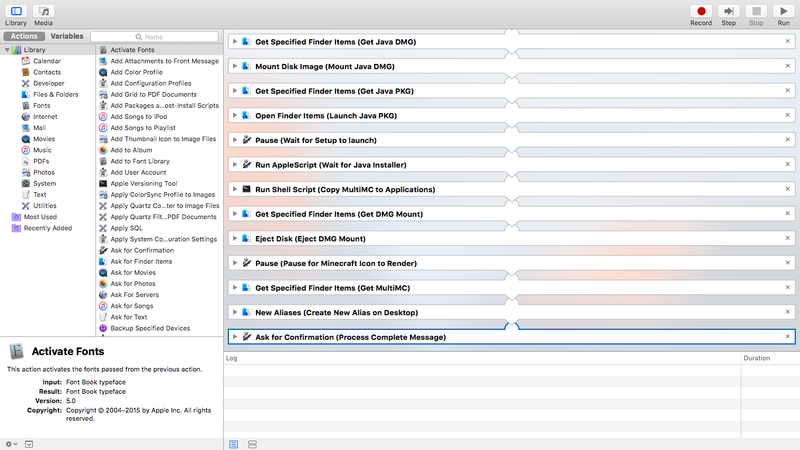 Joshua was pretty confident he would be able to write some batch scripts for Windows and I suggested he check out OS X’s Automator as a way of scripting installation for the MacBooks. Interestingly, he found that he was able to script the installation on MacBooks with Automator in about half the time it took to write a batch file for Windows. The key to making this happen was Minecraft MultiMC, an open source launcher for Minecraft that allows users to run completely separate installations of Minecraft with ease, meaning that we could confidently encourage students to install this version without affecting any other installation of Minecraft they may already have on their laptop. Essentially, a student is provided with a USB key that has an installer launcher that copies MultiMC and a Java installation into a new folder, whilst setting up short cuts in their Applications folder so they can run the game. 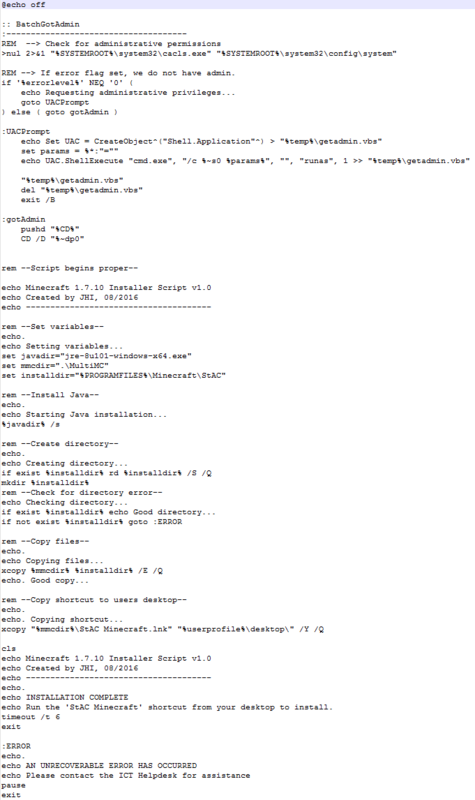 Interestingly, Joshua opted to not include a copy of the Minecraft client application itself within this installer file, instead relying on students having to enter their own Minecraft credentials (linked with their personal paid licensed copy) which would then trigger the download of the client application of Minecraft. This way, we are not distributing any commercial software illegally and the download only adds 1-2minutes to the overall installation process. The key benefit, however, was that MultiMC is already configured to point the installation to the College’s on-premise Minecraft server meaning there was no additional configuration required for students. Additionally, Joshua set this up to run on a non-standard port so that if other students were using Minecraft at school they could not accidentally connect to the school’s Minecraft server and become a nuisance. All up, it takes less than 5 minutes for a student to install this version of Minecraft from a USB key provided by the teacher. I had a huge sense of personal satisfaction with the finished solution because I was a bit worried about how I would be able to deliver all of this at the start, or even if it was possible. Ultimately, it was ICY Admin that made it all possible and this was something I found only through researching for this project. It’s nice to know that the hundreds of hours I’ve spent administering Minecraft servers in my own time have paid off and could be used in an educational context. For me, it is pleasing to know that we have a secure, robust and extensible platform which teachers will be able to use relatively painlessly thanks to the efforts of Joshua in this area. It remains to be seen what interesting curriculum uses arise from this and I’ll certainly be posting a followup blog highlighting this. One of the key reasons TeachMeets are successful is that presenters are limited to only 2minutes or 7minutes for their presentations. This results in a fast-paced event and a range of different ideas and solutions being shared. It also means that preparation for the volunteer presenters is kept at a minimum – it’s not onerous to share something you’re already doing in your classroom or researching to give a go. Schira Withers (Our Lady Of The Star Of The Sea) How we as educators can help students with low working memories improve their self-management skills using digital technologies, thus allowing them to experience success and move from a fixed to growth mindset. Donna Jones (St Andrew’s College) Using a 3D app to inspire creative thought and ideas for creative writing. When one of the presenters was unable to attend at the last minute, I added some thoughts on using Google Earth to create personalised tours to round out the afternoon.